Top quality, exclusive design invented by us through more than 25 years experience. Layered fabric with smart sewn black edging. 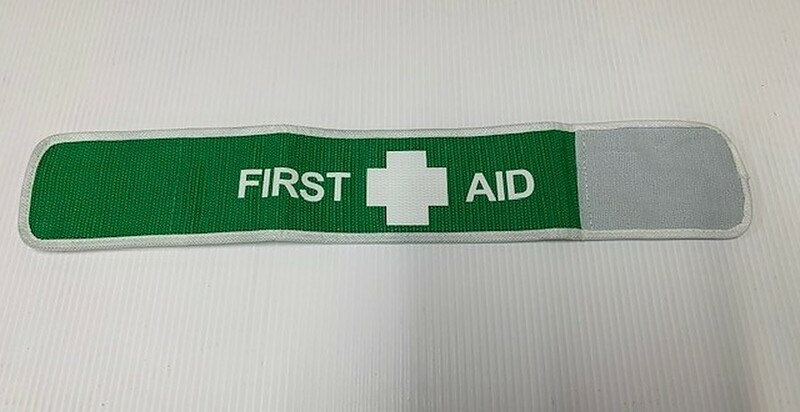 Hi-visibility yellow coloured bands with highly reflective central band, official first aid green with brilliant white cross and lettering. Creates a hi-tech 3D effect, even in day time, according to angle of light sources. Highly reflective in the dark. Instantly identifies the first aider and provides re-assurance and comfort to the injured or those needing treatment. A must in workplaces to identify the responsible persons charged with providing first aid as a part of their role. 5cm wide x 45cm long. Velcro adjustable to fit any arm, washable. Official First Aid signage according to Australian Standards.